If you’re lucky enough to get to travel abroad, you know it’s getting easier and easier to use our phones and other gadgets to translate for us. So why not do so in a way that makes sense to you? 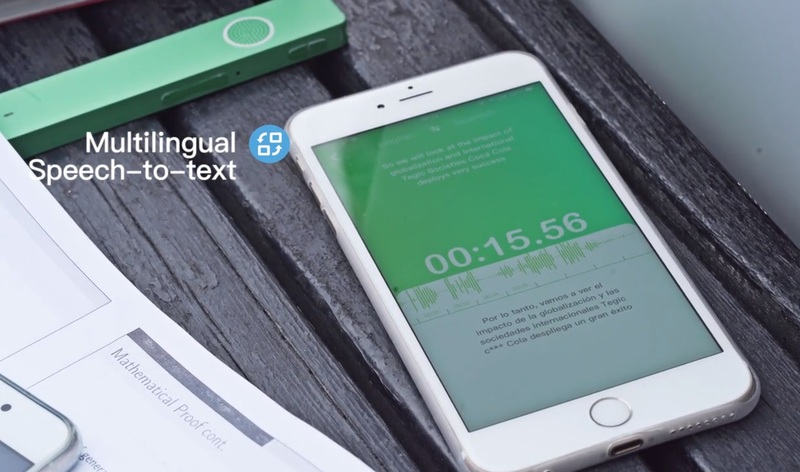 This little gadget seeking funds on Kickstarter looks right up my alley, offering quick transcription and recording — plus music playback, like an iPod Shuffle with superpowers. The ONE Mini is really not that complex of a device — a couple of microphones and a wireless board in tasteful packaging — but that combination allows for a lot of useful stuff to happen both offline and with its companion app. You activate the device, and it starts recording and both translating and transcribing the audio via a cloud service as it goes (or later, if you choose). That right there is already super useful for a reporter like me — although you can always put your phone on the table during an interview, this is more discreet, and of course a short-turnaround translation is useful, as well. Recordings are kept on the phone (no on-board memory, alas) and there’s an option for a cloud service, but that probably won’t be necessary, considering the compact size of these audio files. If you’re paranoid about security, this probably isn’t your jam, but for everyday stuff it should be just fine. Right now translation online only works, but I asked and offline is in the plans for certain language pairs that have reliable two-way edge models, probably Mandarin-English and Korean-Japanese. It has a headphone jack, too, which lets it act as a wireless playback device for the recordings or for your music, or to take calls using the nice onboard mics. It’s lightweight and has a little clip, so it’s probably better than connecting directly to your phone in many cases. There’s also a 24/7 interpreter line that charges two bucks a minute that I probably wouldn’t use. I think I would feel weird about it. But in an emergency it could be pretty helpful to have a panic button that sends you directly to a person who speaks both the languages you’ve selected. He pointed out in an email to me that obviously wireless headphones are hot right now, but the translation functions aren’t good and battery life is short. This adds a lot of utility in a small package. Right now you can score a ONE Mini for $79, which seems reasonable to me. They’ve already passed their goal and are planning on shipping in June, so it shouldn’t be a long wait.